It is often necessary to monitor gas concentrations even in sealed off processes or not accessible areas. Typical applications are for example silo and tank monitoring, land fill gas measurement or bio gas facilities. Direct measurement within these processes is often impossible due to adverse application conditions. Sampling from process gas and external measurement are required instead. With the integral Measuring Concepts of the IMC Series ExTox offers efficient solutions even for those measuring tasks. This Series combines all necessary components in one compact wall mounted housing – from sampling and preparation of measured gas, sensor technique and evaluation. High flexibility in adaptation to the respective application conditions held the spotlight when designing the concept. Thus only the respectively necessary components are fit with. 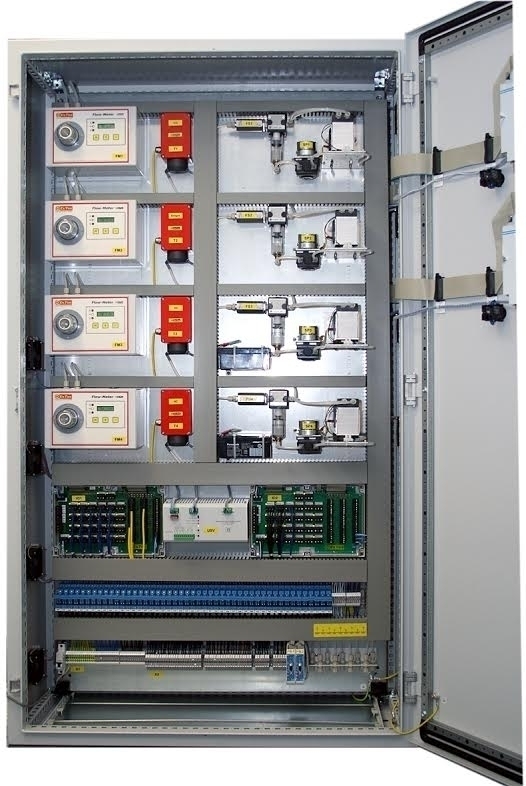 The modular construction and the use of the approved ExTox-Transmitter and Control Units ensure a cost efficient purchase and maintenance. The IMC-8D covers a control unit of the ET-8D Series. Evaluation of measuring signals and the release of operating commands forms thus part of the integral measuring concepts. The extension of the control unit software integrates the control and monitoring of the components for sampling and preparation of measured gas. Due to eight available measuring channels it is possible to integrate even external transmitters without additional expenses into the system, for example for monitoring ambient air. The IMC-8D-Biogas is an example for customer specific solutions which could be designed on basis of the IMC-8D according to your requirements. It is aligned to the special requirements of the biogas analysis. The type IMC-4D-Biogas is the smallest available system. In addition to the usual outputs, like LED’s, displays, analogue outputs and relays we can as an option adapt a range of special features, such as for example our visualisation software ET-View / ET-Diag. Integral Measuring Concepts Type Article no.